Domino’s Icons of Style #6: Moroccan Poofs | Keep Domino Alive! « We Love Domino is in the Washington Post! Today’s guest post is another installment in the series, Domino’s Icons of Style, by Beth of Style Redux – who also was in the Washington Post today! Let us know what your personal opinion of each icon of style is in the comments: love it? hate it? used it in your own place? We want to know what you think! 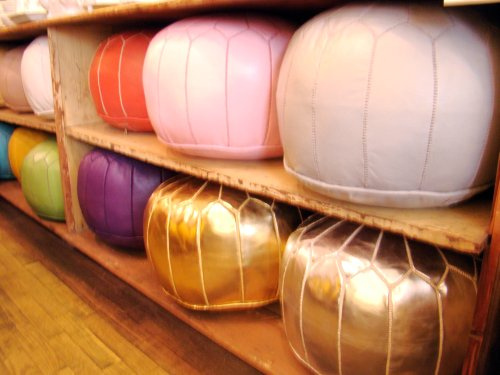 The Moroccan Pouf is a round leather embroidered ottoman. I first saw them in Domino Magazine and was fascinated by their beautiful colors and adaptability. They come in any color and stitching, in metallic and non-metallic. Incredibly versatile – they can be used as seating, a coffee table, a stool, a small table, or as a great decorative item. I have two in front of my fireplace-they are great as multiples. 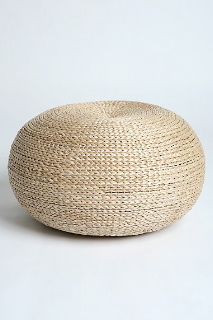 Wonderful in a living room, bedroom, media room, even outdoors in this fun wicker version. You can spend as little or as much as you want for one; I have seen them on eBay and in hip neighborhoods starting at $25, but you can spend $250 or more for higher quality leather, embroidery, and larger sizes. 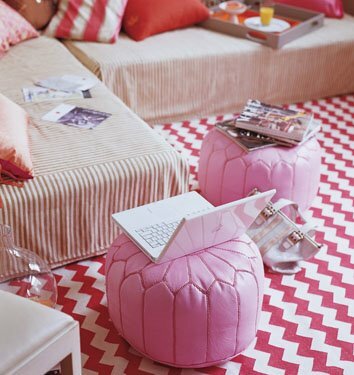 Another zebra rug and pouf-fabulous! 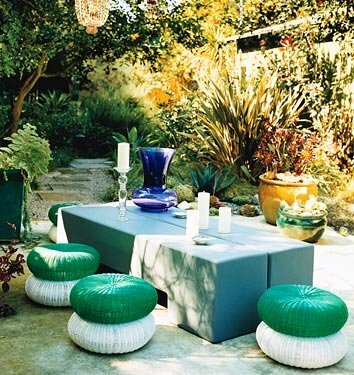 Love that rattan pouf! Not seeing it on UO’s website though….do you have a link?? do we know where the zig zag red and white rug come from? Yes Barbara, it is a gorgeous Madeline Weinrib called “Amagansett” and costs $999. It was featured in the November 2005 issue. 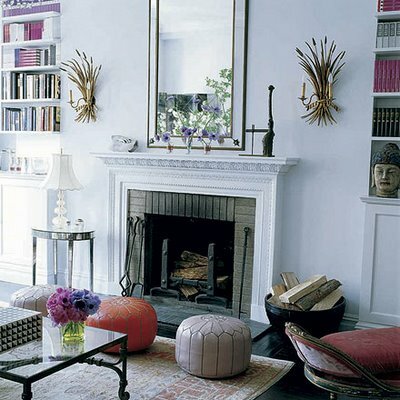 I also love the yummy John Derian poufs. 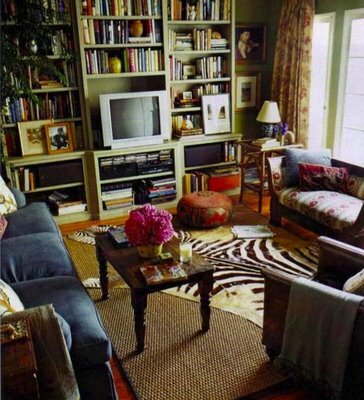 Weinrib’s rugs are stunning and really make a room!